Instead, as fate would have it, I relocated to New Mexico at the end of 2009. Many, many people were baffled at this choice, and I’ve answered the question of “Why New Mexico?” more times than I can count in the last two years. Lots of things usually get thrown into the answer: the artsy people, the wide openness, the cost of living, the unique lifestyle, the space and tranquility, the cultural heritage. Bells went off when I read this paragraph. I didn’t carry out my expatriate dream, technically, but I found something of an equivalent in my own country. To say that New Mexico is “a little different” than other states is an understatement. It feels like another country because for hundreds of years it was another country – it was part of Spain for more than 200 years, and then part of Mexico for a short while, before becoming a US territory. Many Americans do not know there's a state called New Mexico. Those who do realize it’s a state are often confused about it. The license plates say “New Mexico USA” to clarify things. It’s the only state in the US with a bilingual constitution. Along with CA, it’s one of two states with a Hispanic majority. We have the first female Latina governor, Susana Martinez. The state flag colors honor Isabella of Castilla. The state flag symbol (the Zia sun symbol) is Native American. Most city (“Santa Fe”), street and forest names are Spanish. The Pueblo (“adobe”) style architecture is one of a kind. You get the point. It just took me a while to get it – that New Mexico is clearly an extension of my previous wanderings and the strong tug I felt to move to Latin America. Now, as I drive home on a dirt road looking at cows in the field, I realize it’s not unlike a scene I would see in rural Nicaragua (minus the desert terrain, of course). Without exactly realizing it, I got the best parts of what I liked about Nicaragua – including a slower pace, a Spanish-speaking culture, extreme friendliness and the ineffable feeling of being somewhere so completely different – and yet with all the conveniences that come with the good old USA, such as reliable mail and FedEx delivery. And around the holidays, you all know how important that is. So I guess there's just one thing left to say: Feliz Navidad! p.s. 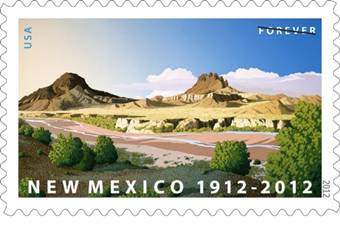 On January 6th, the US Postal Service will release New Mexico’s official Centennial Stamp, which is pictured above. Keep an eye out for it as it’s quite gorgeous.